Recent Airport improvements include a new entrance road & loop with commercial lanes, LED lighting, new entrance & exit plazas, a new Rental Car Lot for 8 rental car agencies and a 240-space covered parking lot. 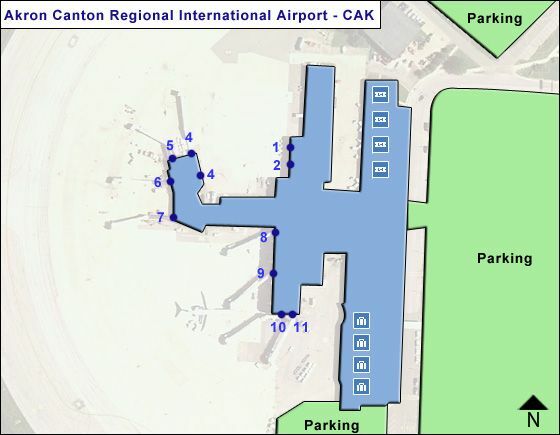 Akron Canton Regional Airport has one passenger terminal. - The Ground level is the Arrivals & Check-in level - with Arrivals area (west) with baggage claims 1-4, rental car counters; and a 'Ticket Wing' (east) with check-in facilities and acces to security check and gates; in the center of the ground level is an Information desk, vending machine, comfort seating, mobil boarding passes, Subway, Buckhead Grill, JJ's Sports Bar, and a gift shop. - Level 2 is the Departure level with an Atrium in the center, surrounded by the departure gates. The Atrium houses an ATM, while Cinnabon & CAK Marketplace are near the gate G1 entrance. The Atrium connects to gates G1-G7 on the same level, while an elevator or escalator is needed for gates G8-G11. - gates 1 & 2 are to the right of the Atrium (next to Cinnabon & Marketplace) and serve United. - gates 3 - 7 are to the north of the Atrium and serve Delta & American airlines. Near the entrance is Step2 Play Port & Ohio Desk Business Center, thereafter you find a mother's room, work stations, CAK Marketplace Cafe and the Great Lakes Bar. - gates 8 - 11 are to the west of the Atrium (reached by elevator/escalaor) and serve United and Spirit airlines. It houses Arby's & Great Lakes Brewing. Airlines presently serving the Airport: NOTE: American, Delta, & United allow you to use your mobile device to display your boarding pass at check-in, at TSA security checkpoint, and to board your plane. - upgrades to the ticketing wing (new counter with 3 ticket positions; 150 feet of extra check-in space; adding baggage make-up & TSA baggage check spaces). - Upgrades to important passenger 'touch points' to provide for a less stressful experience. - Expansion of the upper-level concourse by 300 feet with 3 more gates & business club, 300 added seats, glas arium, & added restrooms.